Thomas Christiansen has spoken for the first time on his sacking as Leeds United head coach, citing too high expectations and the inability to adequately replace Samuel Saiz after he was handed a long suspension as major reasons for his departure. 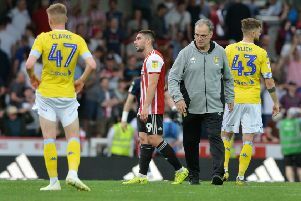 Making a flying start to the season created a belief that the Whites were heading back to the Premier Division, but Christiansen said the squad was not big enough to sustain absences like Saiz’s when he was banned for six matches. Speaking to Danish newspaper BT, Christiansen said: “Our best player, Spaniard Samuel Saiz, got a red card for spitting at an opponent in the face as we went out of the FA Cup against Newport. He got six matches out and some of the others also got long suspensions. Christiansen oversaw a nine-game unbeaten start to the season after being appointed at Leeds in the summer following Garry Monk’s departure, but that start ended up being a problem for the head coach as it had raised expectations the team could not sustain. He added: “It’s a big club which really dreams of moving back to the Premier League where they believe they belong. Every single season the club and its fans believe that now they’re there. “The club’s fans said the team had not played so well for over a decade. With our good start, expectations grew a little more. “I would like to say so much that the club must be more patient. The current trainer, Paul Heckingbottom, is the eighth since 2014, and I don’t know if he’s there next season.